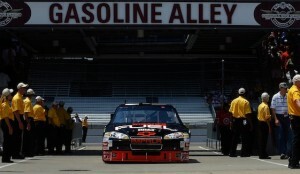 Racin’ Today » Woody: Are Outhouse Races Next For Indy? Woody: Are Outhouse Races Next For Indy? I remember a time when outhouse races were held to drum up interest in a NASCAR race. Might that be next for Indy? 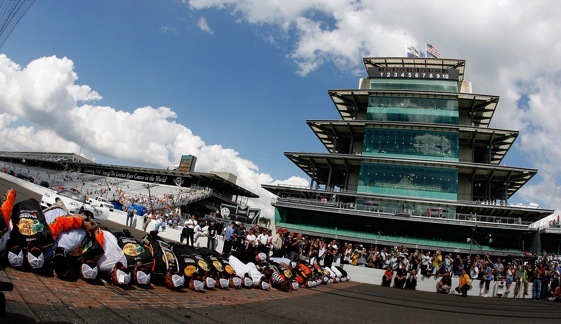 Who’d have thunk that the once-ballyhooed Brickyard 400 would require a supporting cast to draw a crowd? I covered the inaugural 1994 race and some estimated the crowd at 350,000. One Indy official was quoted as saying they could have sold a million tickets if seats were available. Fast forward to this weekend’s race. Reports are that ticket sales are sagging worse than a 1930s Brickyard beauty queen. One fan carelessly left a pair Brickyard 400 tickets lying on his car’s dashboard. When he returned, someone had broken into his car and left another pair of tickets. OK, that may be an exaggeration, but what’s NOT exaggerated is the fact that Indy is being forced to add a couple of under-cards to its main event in an attempt to draw a crowd. The same-weekend Nationwide Series race is being moved from a popular nearby short track to the big arena, and a sports car race also has been added to the menu. What we’re seeing at Indy is a return to racing’s past, when promoters had to hustle to sell tickets. Back then the media generally ignored the sport and the track owner often scheduled extra entertainment and events to help draw a crowd. was a promotional genius, a carnival barker in a banker’s suit, and he kept the fans flocking. One popular event every summer was the Joie Chitwood Thrill Show. Evel Knieval came to town one year and tried to jump over a building. Another daredevil jumped OFF a building. He plunged out of a 10th-story downtown building and landed on a stack of mattresses. It was unclear what was the relationship between leaping out a window to motorsports, but Donoho was there when he landed, selling tickets to the upcoming race. Bill’s son Jimbo also had a flair for publicity. Once, amid a spat with country star Webb Pierce, Jimbo dumped a truck-load of live catfish into Webb’s swimming pool. Of course he called the TV stations first, to make sure the cameras were present and rolling. The race fans loved daredevils, stunt drivers and other showmen. One popular attraction was Dynamite Bob, who blew himself up in a casket on the front stretch. The casket was filled with flour, which plumed up into a giant mushroom cloud when Dynamite Bob set off the fuse. The act’s link to racing was a bit fuzzy, as was Dynamite Bob after a performance. it over nine and one-half buses and was taken away in the track ambulance. Another motorcycle stunt rider jumped off a plywood ramp and through a Flaming Circle of Death. A large hoop was soaked in gasoline and set afire. The jumper made it through the flames the first time but – perhaps inspired by the cheering crowd – pushed his luck with an encore. On his second launch off the ramp he mid-judged the Flaming Circle of Death. He collided with the burning hoop and went tumbling down the track, trailing smoke and sparks. As rescue workers extinguished the flames he managed a feeble wave to the fans, lying down for his standing ovation. There were demolition derbies in which competitors driving clunkers battered each other beyond recognition and the last man standing won. It was the forerunner of restrictor-plate racing at Talladega. One popular event back when Nashville hosted two annual Cup races was the summer Outhouse Race. Drivers would pull replicas of old-fashioned outdoor privies around the track while legendary country music emcee Ralph Emery called the action. The media, of course, ate it up, generating tons of publicity for the upcoming Cup race. Maybe Indy should give it a try if its other ploys don’t work. An outhouse race couldn’t stink any more than the Indy NASCAR race. While I’m a huge Indy 500 fan, the stockers run in line like guys (and girls) waiting to get into the restrooms during a long caution. I’m sure one of the bright spots at Indy this weekend will be the Big Machine Records.com shows. The many artist being ferried from Nashville to Indy by Scott Borchetta’s record companies will provide great entertainment. More so, I’m afraid, than the race….I hope I’m wrong about the race. I know the Nashville talent will shine. I remember the outhouse races on Ralph’s morning show. Somehow, I don’t think the “stars” of today would sit down for that type of publicity. Larry, it breaks my heart that Summer X Games had to turn into Bummer X only because Travis Pastrana got hurt and ESPN let a bag of Hot Air Out for Jack Nothing! I feel that I want the Biggest Summer Non-Holiday Weekend of Racing to actually carry some serious heavy metal again and to make ongoing issues worse, Lucas is not happy their Last NASCAR Weekend has turned memorably devasting a la Bender of Original Futurama and the loss will always be on the Trucks as duh, NASCAR needs to Craft their Craft and Sell Grand Am and Extreme Sports and Motorsports DON’T Mix! Well, “The Brickyard” along with other wastes of good racing real estate, Daytona and Talladaga all are on my list of “if you really want to see the race, stay home and watch YOUR TV for free”. Daytona and ‘Dega are just flat too damn big to be able to see all the track without binoculars whereas, on top of that, Indy has seen fit to plug the infield with various structures making it impossible to watch the entire lap no matter where you sit. So….you sit in a seat worth a couple hundred dollars and end up watching THEIR TV (megatron) for about 1/2 to 2/3 of every lap. Priceless? I don’t think so. I wouldn’t go if they gave me a ticket! Apparently the ‘secret’s gotten out’. I couldn’t disagree more. Have you ever been to Talladega? If you sit in the tower seats you can see darn near everything. You may lose them for a half a second as they enter turn three but then you can see them again a half a second later. I would reccomend everyone attend Talladega, I have never been to Daytona but plan to one day. Just get a seat in the tower somewhere from the center of the frontstretch to turn 1 and you will have no problems. Re the outhouse races, were you privy to them? JJ will lose the lead because of a toilet roll got out of the pit. “this is CRAZY….” as he takes P 1 qualifying.